On the 4th of August 1972, an official sponsoring agreement was signed between ALFREDO GIOS (Bici Gios Torino) and GIORGIO PERFETTI owner of the world famous chewing-gum brand «Brooklyn-la Gomma del Ponte» giving birth for 5 years (1973-1977) to one of the most successful professional cycling teams ever existed: the «Brooklyn» team. The following year, Brooklyn decided to create and sponsor a new top level professional cycling team and considering the excellent personal and business relationship existing between ALFREDO GIOS and GIORGIO PERFETTI, the company GIOS was called to be the technical supplier delivering the racing bicycles to the whole team. Based on Italy the team had a mixed roster of Italians, like PANIZZA, ROTA, PASSUELLO, TURRINI and Belgians like DE MUYNCK, SERCU or DE WITTE. But one name above all: the Belgian ROGER DE VLAEMINCK, winner of three Milano-Sanremo, four Paris-Roubaix, two Giro di Lombardia, Ronde van Vlaanderen, Liege-Bastogne-Liege, Freccia Vallone, Paris-Brussels, Milano-Torino, Züri-Metzgete, Tirreno-Adriatico, Tour de Suisse, Cyclocross World Champion in 1975, etc.etc. Art director of the company was DANIELE OPPI who created the name for the «Lambretta» the brand «Chicco» and the «Pic Indolor». 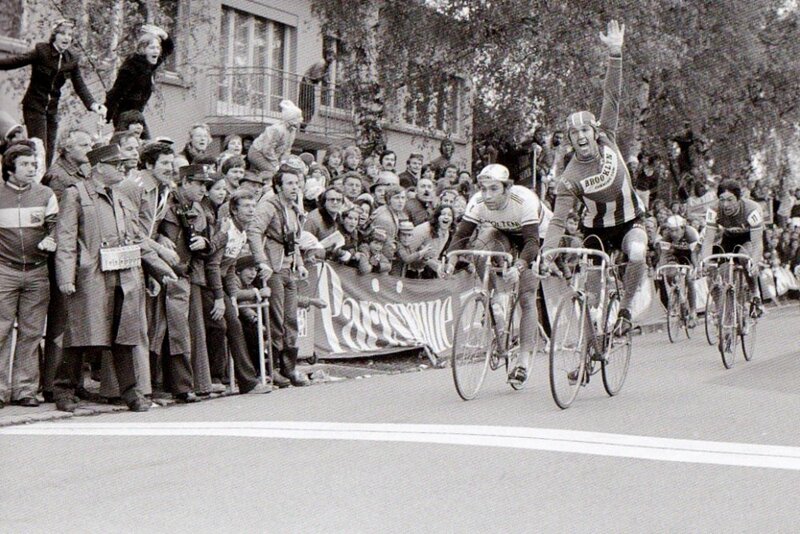 In the picture, ROGER DE VLAEMINCK winning the 1975 edition of the Championship of Zurich «Züri Metzgete» ahead EDDY MERCKX and FRANCESCO MOSER.